Want to practice your short game– or even your long game, if you have the space? We can create a golf tee and putting green for you in your own back yard that will give you years of practice without having to head for the golf course. So some people are gifted with a great swing, and others have to work at it. If you’re one of those “have to work at it” guys– then you might want to consider a golf tee box and or a putting green in your back yard. Your spouse might think it’s extravagant– but think of the time you save in not having to run to the club every time you want to practice your swing, you’ll see the benefit quickly! We do golf tee box installations, putting greens, and we’ve even installed a small par 3 hole for a client one time when he had the space. No matter what you might want to create golf-wise for your back yard, we’ve got the skills to go and build. 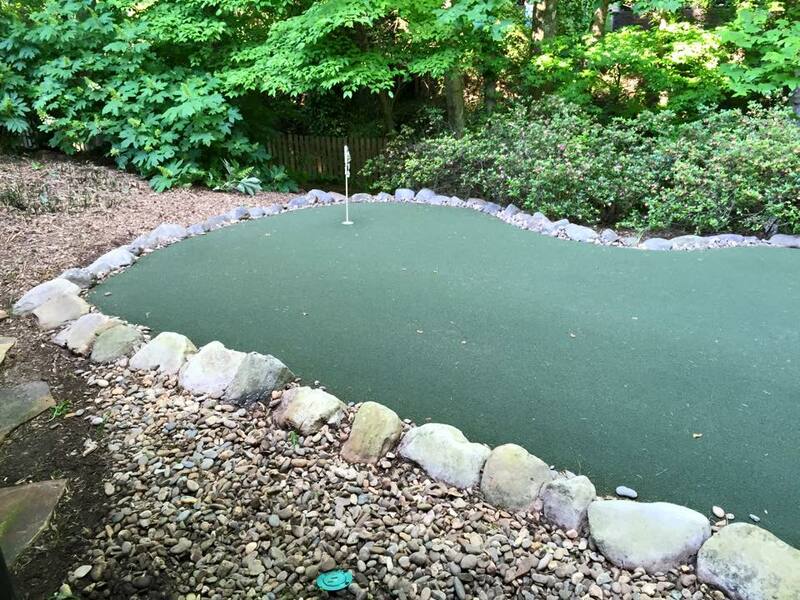 Having a putting green in your backyard can be fun for the whole family, and it will undoubtedly improve your short game. Teach your kids to putt as well! Call Unlimited Lawn Service to get a free quote!